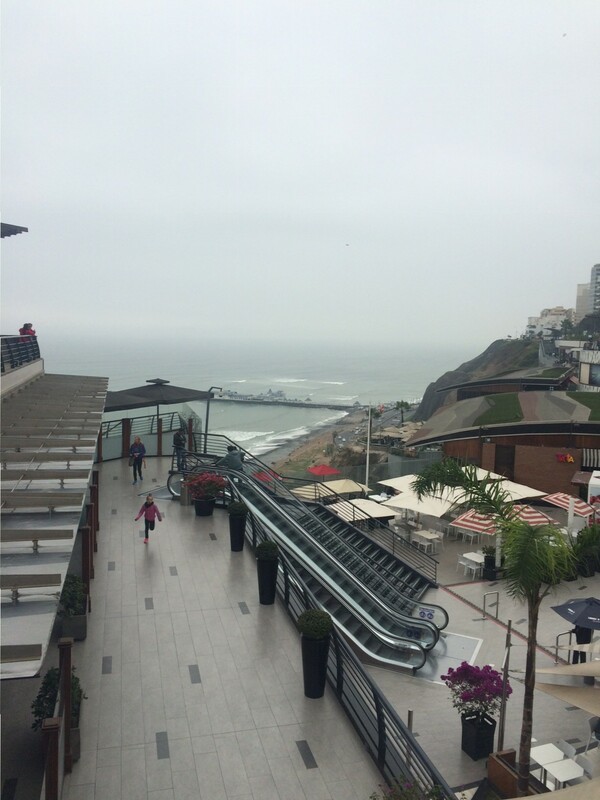 The Four Points was in a great central location in Miraflores, which is the touristy neighborhood along the coast of Lima. The rooms were small, but we really didn’t spend much time at the hotel other than to sleep. There is a decent gym and I was really impressed by the breakfast buffet (pro tip: fill up your water bottle at the gym, where they have a water cooler). The staff all spoke English well and they were very friendly and helpful. I would definitely recommend this hotel if you are visiting Lima. 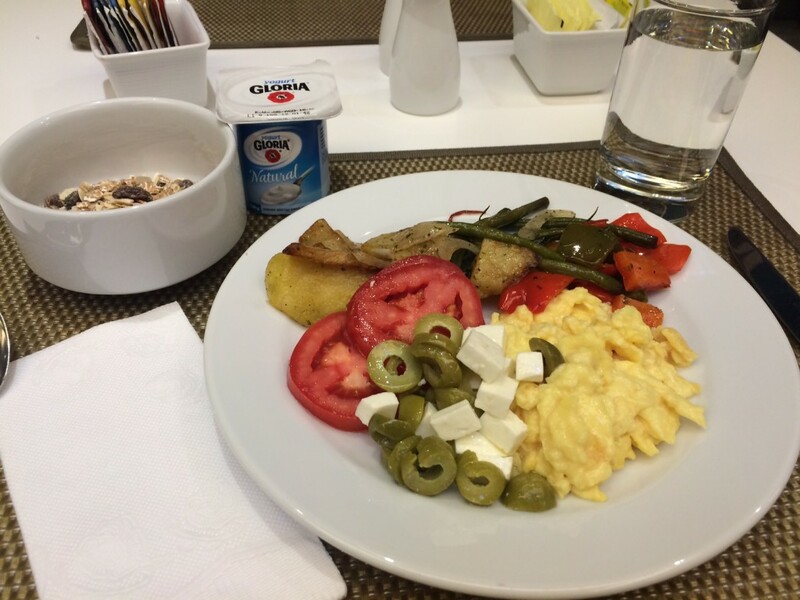 Once we arrived in Lima, we had one focus: FOOD. 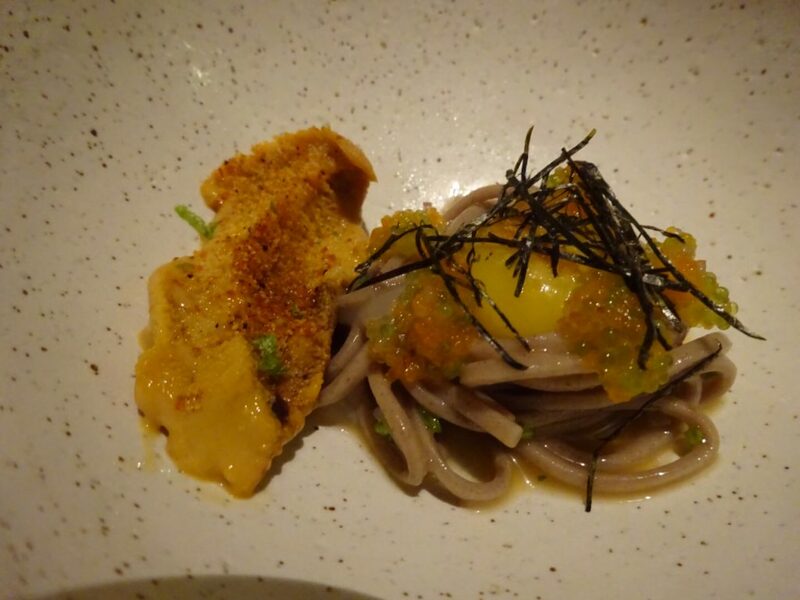 Lima is home to three of the 50 Best Restaurants in the World, and we snagged reservations at two of these. 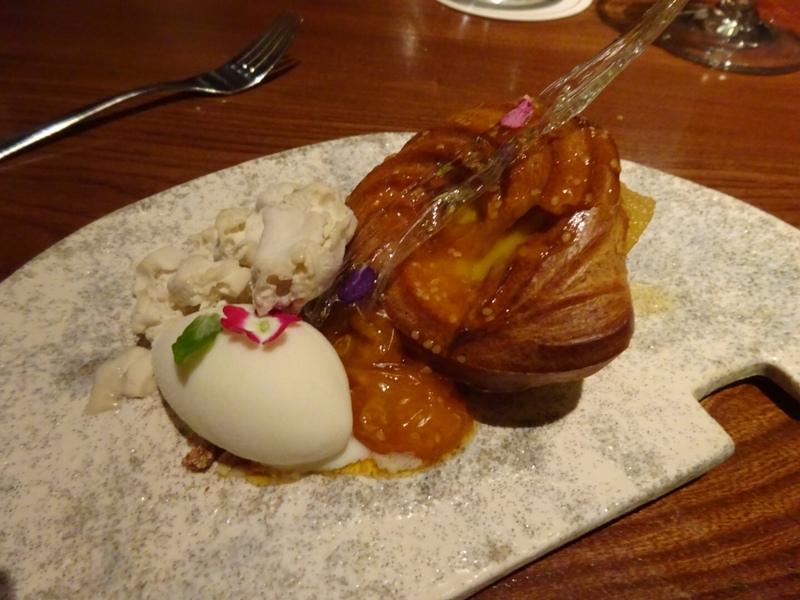 We also visited some more casual eateries that were recommended by various friends who had recently visited the city. As usual, we referred to a recent New York Times 36 Hours in Lima (one of my favorite resources for travel tips). Embarrassingly, we didn’t actually make it to Old Town to see the famous Iglesia de Santo Domingo (a “don’t miss” church according to Lonely Planet), Plaza de Armas (the Plaza Mayor), La Catedral de Lima, or Monasterio de San Francisco (my friend Katie highly recommended visiting the catacombs). 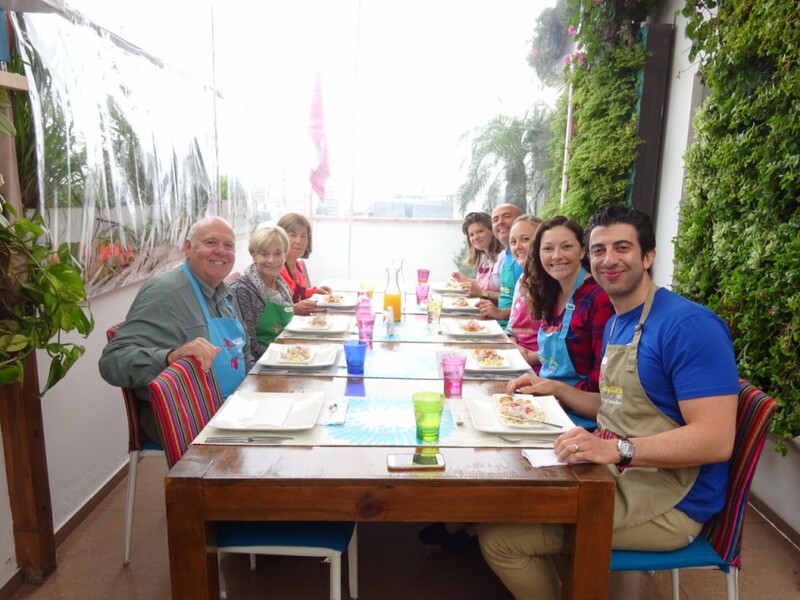 We only had two full days in Lima, and we spent one of these days exploring the neighborhood of Miraflores (near our hotel) and the other taking a great Peruvian cooking class. In addition, Old Town was a 40 minute drive from our hotel, and we just weren’t willing to give up time that could be spent eating and walking to visit some churches. 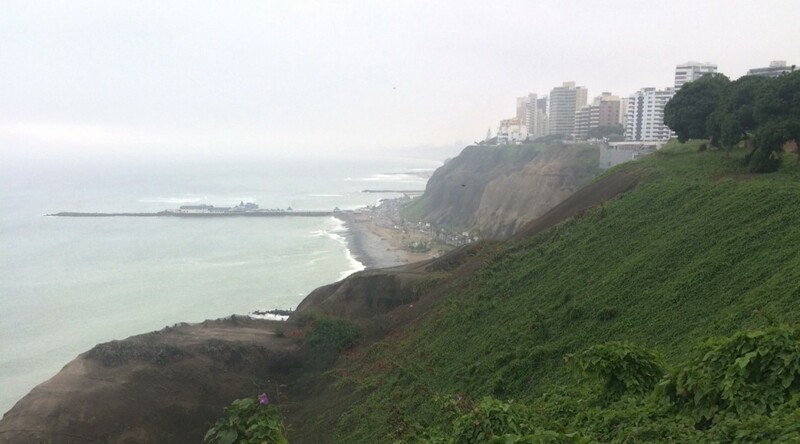 We enjoyed walking along the Miraflores coast. We visited the Larcomar shopping center, which is essentially a mall with a bunch of chain stores and restaurants with a great view. It was a good spot to grab a cup of coffee, but other than that we didn’t find it all that special. There’s a great promenade called El Malecón for walking and running, and apparently paragliding is really popular here in the summertime. I would imagine this area has an entirely different feel when it is warm and sunny. In terms of food safety, I should point out that the tap water in all of Peru (including Lima) is not considered safe to drink. Locals typically drink bottled water or boil tap water vigorously for at 1-3 minutes. We were very careful to avoid drinking the tap water, though we didn’t inquire about the ice used in our drinks. After three days in Lima, I got terrible food poisoning (think Montezuma’s revenge – I’ll spare you the gory details). Jack, however, was totally fine. We tend to share all our food when we eat out, and we ate at pretty nice establishments, so it’s hard to know what got me. 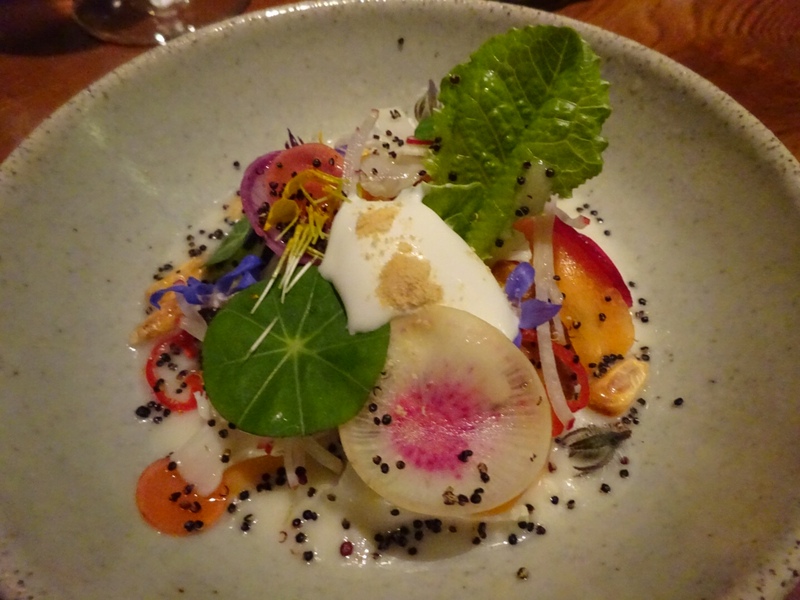 We did eat a lot of raw food in Lima – ceviche and pisco sours made with raw egg white – and I don’t regret that decision one bit. All I can say is that no matter how careful you are, you may end up with a stomach bug. Bring some meds and be mindful, but know that this risk is always there and try not to let it cramp your style. The first night we were in Lima we ate at La Mar Cebichería Peruana, which is located in Miraflores, relatively close to the Four Points Hotel. 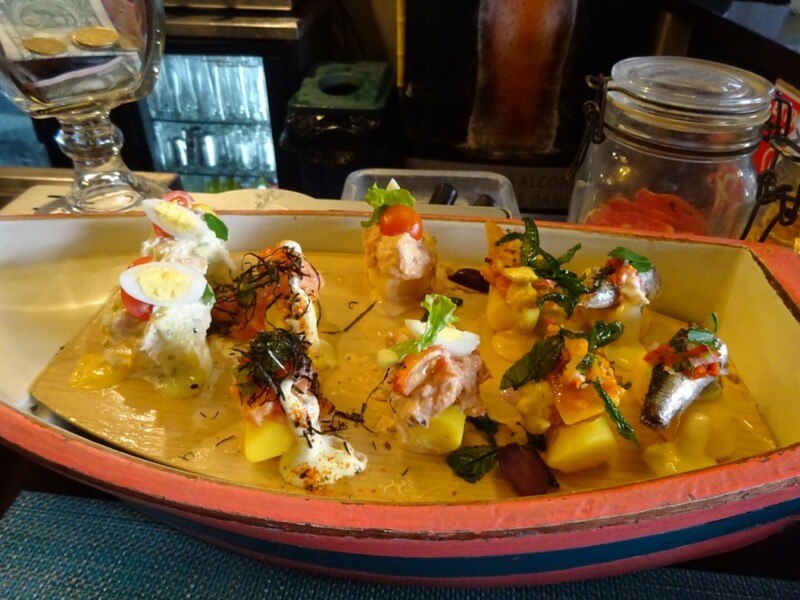 Our friends had recommended this spot, as it has a fun, casual vibe, a great outdoor space, and great ceviche and other traditional Peruvian dishes. 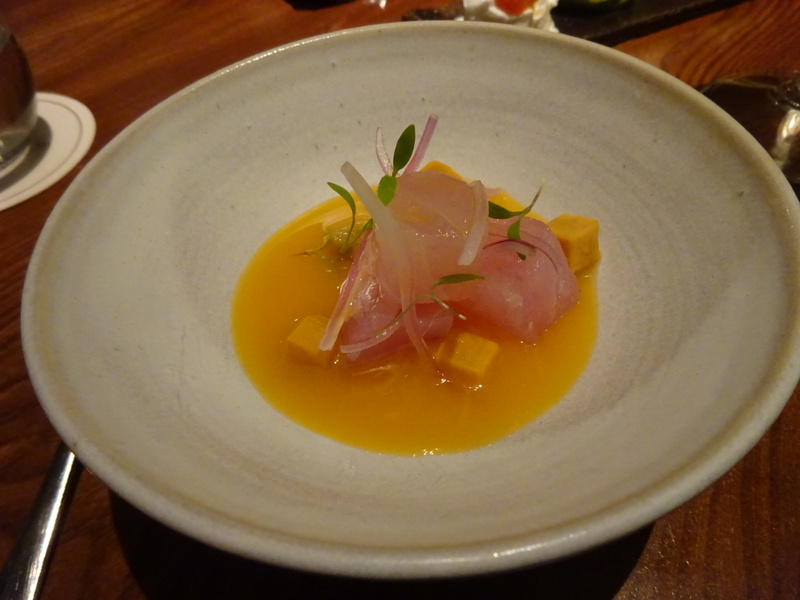 La Mar has seven locations around the world, including one in San Francisco. It is owned by Gastón Acurio, one of the most famous chefs in Peru and considered one of the trailblazers of Lima’s hot restaurant scene. La Mar ended up being the perfect spot for our introduction to the cuisine in Lima: everything was fresh and very tasty. La Mar does not accept reservations, but we easily snagged two seats at the bar when we arrived early Sunday evening (they close at 5:30pm on Sundays). 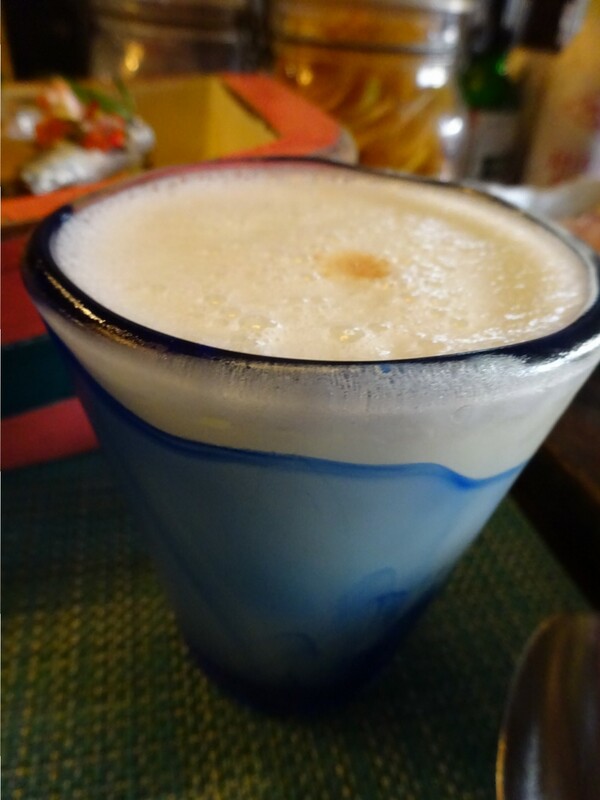 We had our first pisco sours of the trip at this restaurant, and we were hooked; the popular Peruvian cocktail is made with pisco (a grape brandy), sugar, lime, bitters, and raw egg white. It is frothy and delicious. 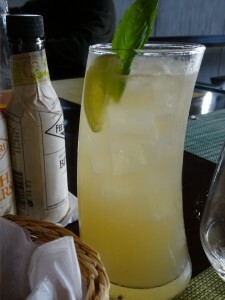 You can also get it with coca leaf-infused pisco, which has a nice herby flavor. We also enjoyed the chilcano de pisco cocktail, which is made with pisco, ginger ale, and lime – it was sort of like a Peruvian Moscow mule. They went down quickly! We were also served several snacks when we first sat down, which we found to be the case at most of the restaurants we visited in Peru. 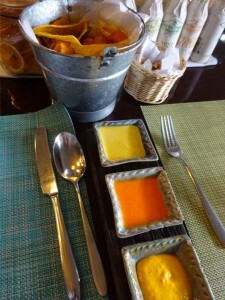 La Mar served root vegetable chips with various chile sauces, as well as “cancha” – toasted corn that is either roasted or deep fried and sprinkled with salt. 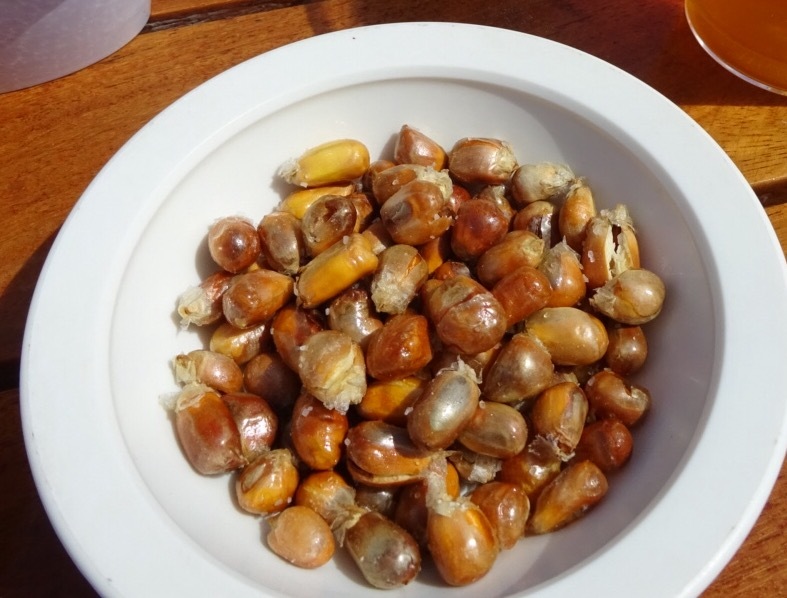 The corn looks more like unpopped pop corn than the traditional starchy “corn nut” that we all grew up with. It was addicting! 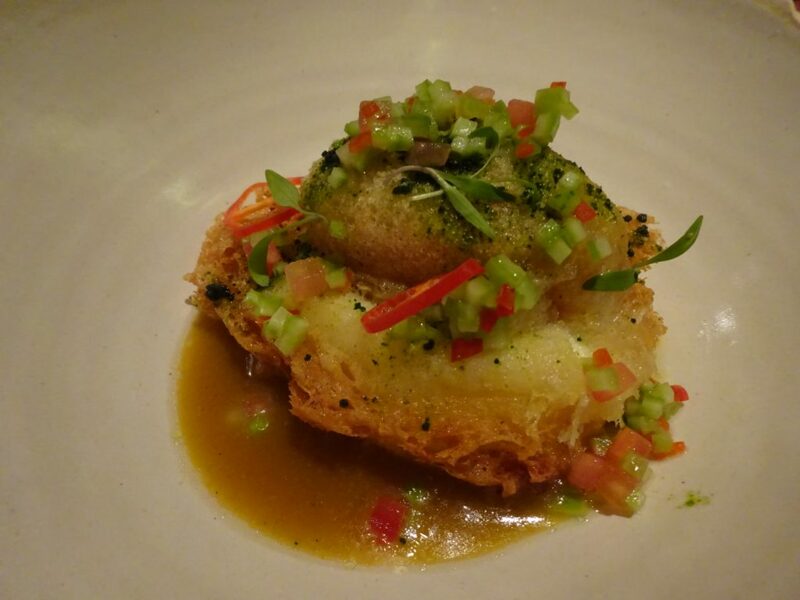 We opted for some traditional Peruvian dishes that highlighted the fresh fish found along the west coast. We ordered “los 3 clásicos” which included three different cevichés: Pesca del día (fish of the day), Mixto (pescado y marisco de día, leche de digre de ajías = fish, shellfish, tiger’s milk with yellow chiles), and Nikei (atún o bonito, leche de tigre al tamarindo = Japanese influenced preparation of tuna, dried fish, tiger’s milk with tamarind). Peru has a rich history of immigrants coming from a variety of other countries including Japan, China, and Italy, and you will see these culinary influences mixed in with the other traditional Peruvian dishes eaten by indigenous peoples and early Spanish settlers. We also ordered a sampler of causas called La Chalana. Causas are cold appetizers comprising a mashed yellow potato base (mixed with lime, onion, yellow chili, and oil), topped with a variety of toppings including avocado, chicken, tuna, shellfish, boiled eggs, and olives, drizzled with mayonnaise. I wasn’t totally sold on causas after this meal – I love me some mayonnaise, but these were swimming in it. They reminded me of some of the pinxtos we tried in San Sebastián, Spain that had a bit too much mayo. 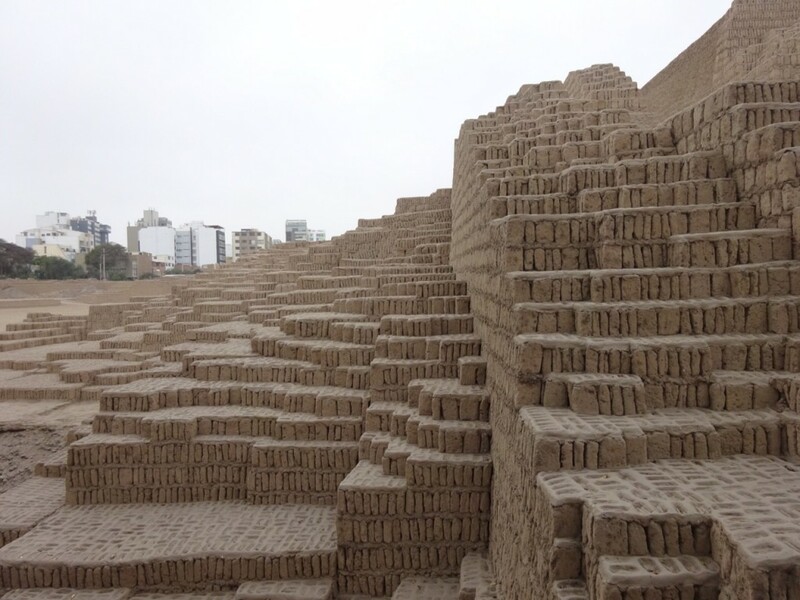 The next morning we walked around Miraflores and made our way to ancient ruins called Huaca Pucllana. 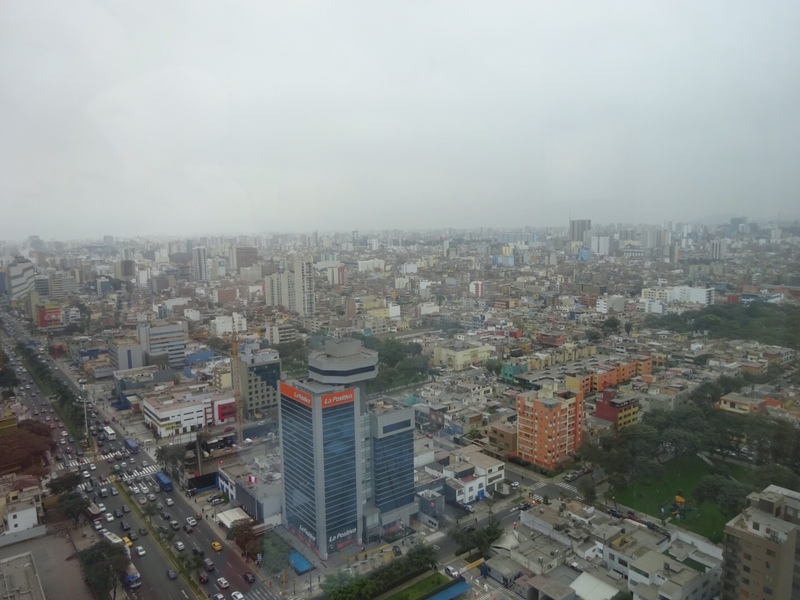 Jack and I love to explore foreign cities on foot; however, Lima was definitely less pedestrian-friendly than the European cities we’ve visited. The sidewalks were narrow, crowded, or nonexistent, and crosswalks are more of a “suggestion” than a rule. Be very careful while walking – be mindful of your surroundings and don’t wear headphones! The drivers will not slow down for you. Huaca Pucllana was pretty fascinating. We took a quick guided tour in English and learned about the ancient civilizations that used this site. 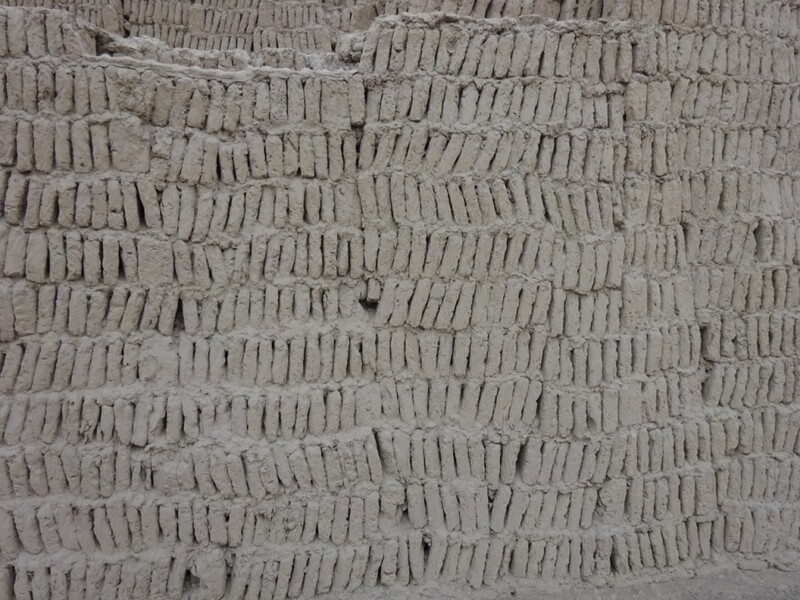 We also learned about how dry Lima is, and that ancient civilizations would have elaborate ceremonies asking the gods for rain (“it doesn’t rain in Lima!”) We also got to see how the hand made bricks were laid to sustain earthquakes, an unfortunately common occurrence in Peru. It was a quick, interesting, and relatively inexpensive outing in Miraflores. A colleague of Jack’s highly recommended a restaurant called Pardos Chicken, which is known for their roast chicken. Pardos is actually a chain restaurant in Lima – we saw locations in the airport as well as the Larcomar shopping center. However, the location we went to (Alfredo Benavides 730, Miraflores Lima 18, Peru) has a legit restaurant feel and you can see the roasting chickens when you enter. 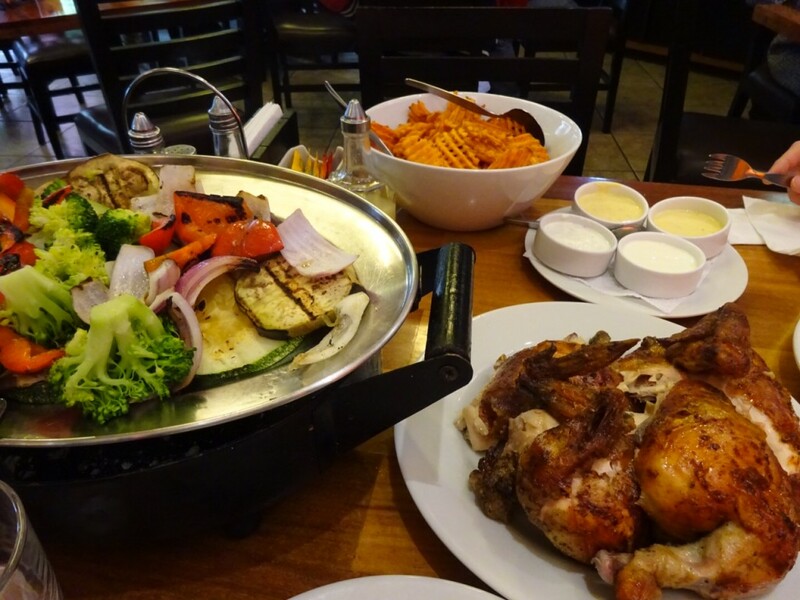 We stopped by for a delicious lunch of whole roasted chicken, roasted mixed veggies, and sweet potato fries accompanied by various dipping sauces. We each had a beer and the whole meal was fantastic and less than $20 total. I would highly recommend going here for a tasty, affordable meal. It is a pretty large restaurant and would be perfect for groups. After lunch, we walked around Miraflores a bit longer, then headed back to the hotel to rest up for dinner. 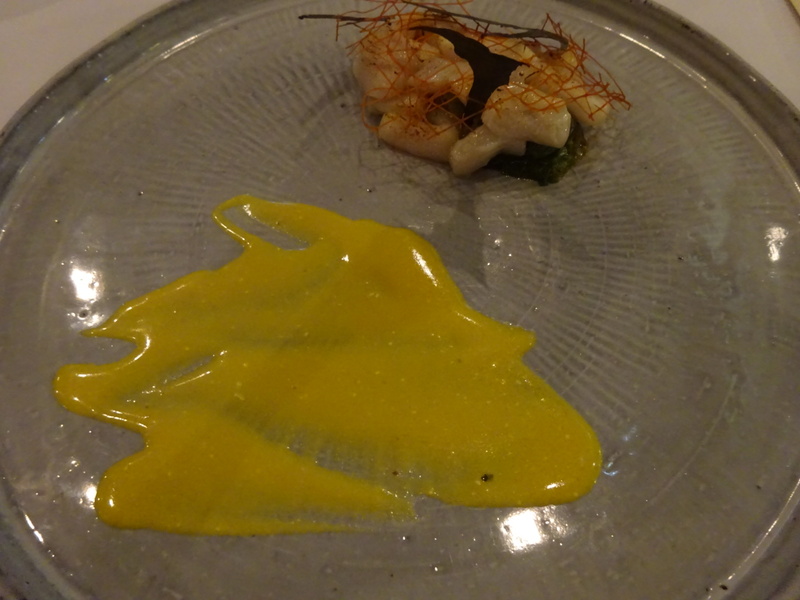 We had made dinner reservations three months earlier for the 4th Best Restaurant in the World: Virgilio Martinez’s Central. Ready to start our culinary “tour” through Peru! 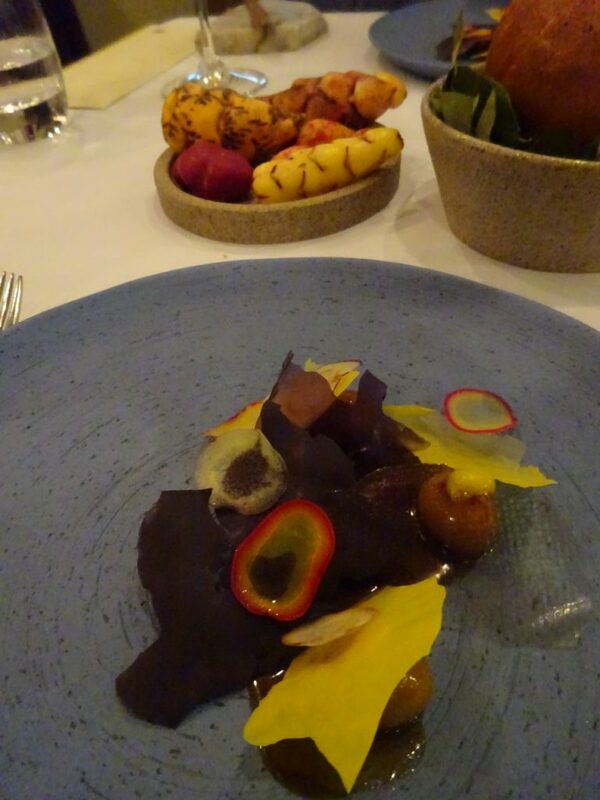 The dining experience at Central was unlike any other we’ve had during our travels. 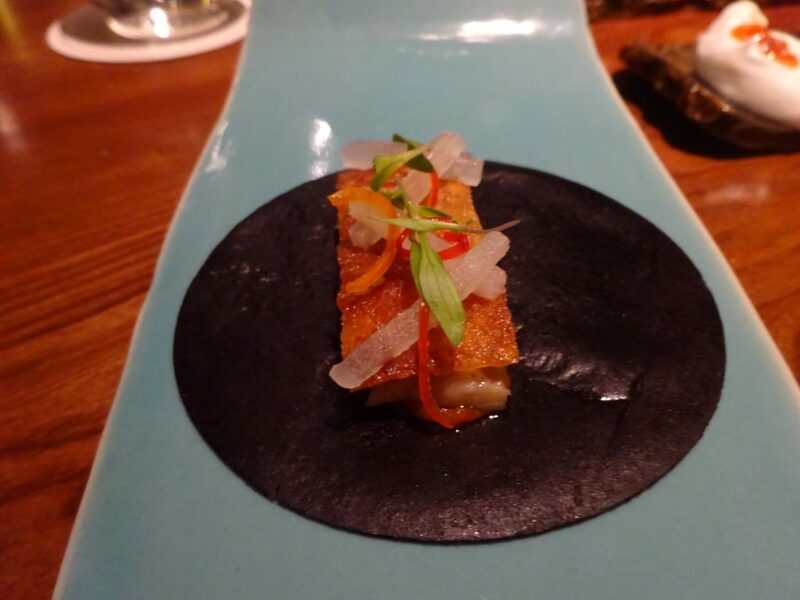 The terrain and climate of Peru is so diverse – the cool, dry coast contrasts with the wet, rich Amazon rain forest, as well as the harsh, extreme elevations of the Andes mountains – and the tasting menu at Central reflects this diversity. 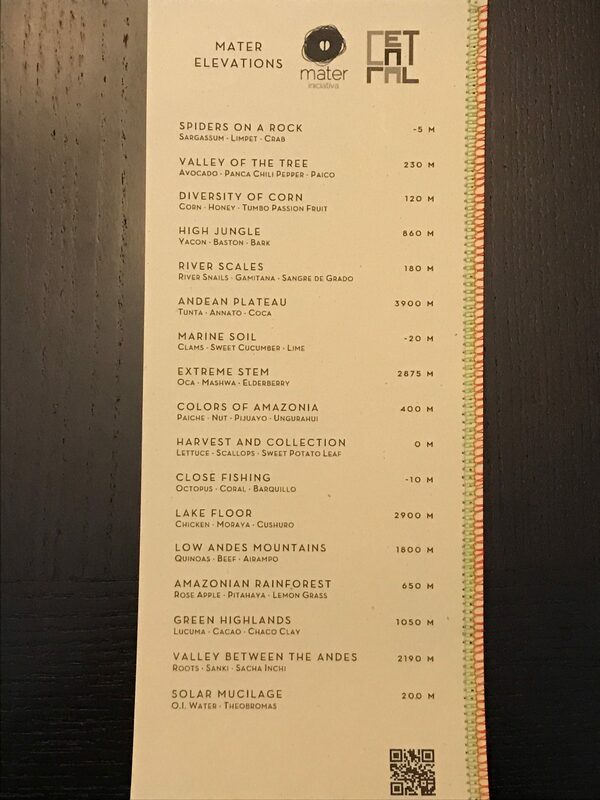 The menu we chose was called “Mater Elevations,” and it included the elevation in meters for the main ingredients of each dish. 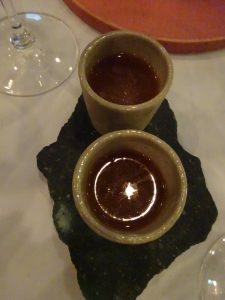 The food at Central was incredibly unique, and really highlighted each ingredient that was used, many of which we had never tried before (river snails? Edible clay?) We enjoyed each item, but the tasting menu really started to hit a winning streak with “Extreme Stem” – this was actually served to us by chef Virgilio Martinez himself, and he brought out a plate of uncooked potatoes so we could see how this beautiful, tasty dish of potatoes started out. I didn’t realize before this trip that potatoes are indigenous to the Andes mountains. We were told frequently that there are roughly 3,800 different species of potato in Peru! Potatoes were introduced to the rest of the world about 400 years ago, and are now the world’s fourth-largest food crop. I had always associated potatoes with Ireland, perhaps due in part to the Irish Potato Famine; as one of our guides pointed out, the fact that potatoes were not indigenous to Ireland, as well as the fact that only one monoculture was planted, made these crops particularly susceptible to a blight. The next few dishes were outstanding: “Colors of Amazonia” (river fish with crispy palm fruit), “Harvest and Collection” (scallops with crispy sweet potato leaf), and the infamous “Close Fishing” which was the inspiration for San Francisco restaurant In Situ‘s “Octopus and the Coral.” This roasted octopus was served with a steaming shot of rich, umami octopus broth that was to be sipped alongside the dish. 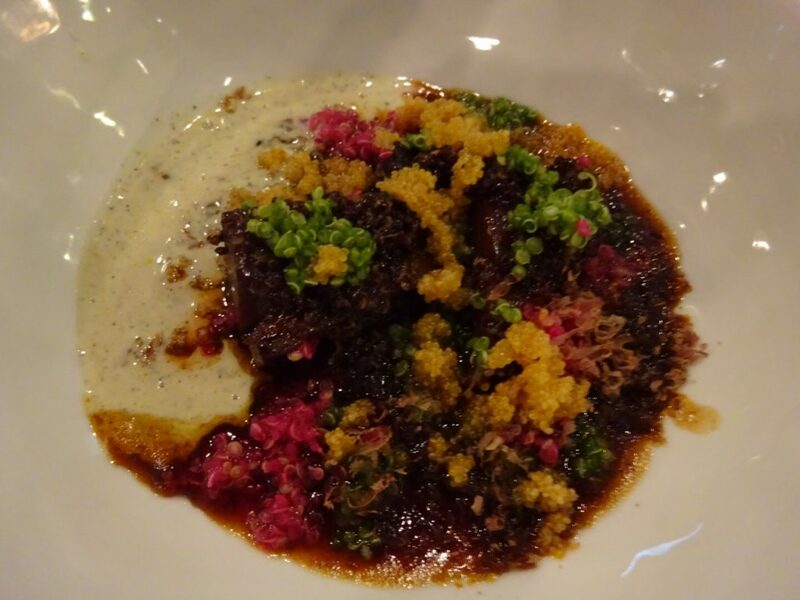 The next dish that really stood out to us was “Low Andes Mountains” which included five different types of quinoas with beef short ribs. Who knew there were so many beautiful types of quinoas? Bright green, pink, yellow – it was as beautiful as it was delicious. Quinoa is also indigenous to Peru, and there are over 100 different kinds of quinoa. 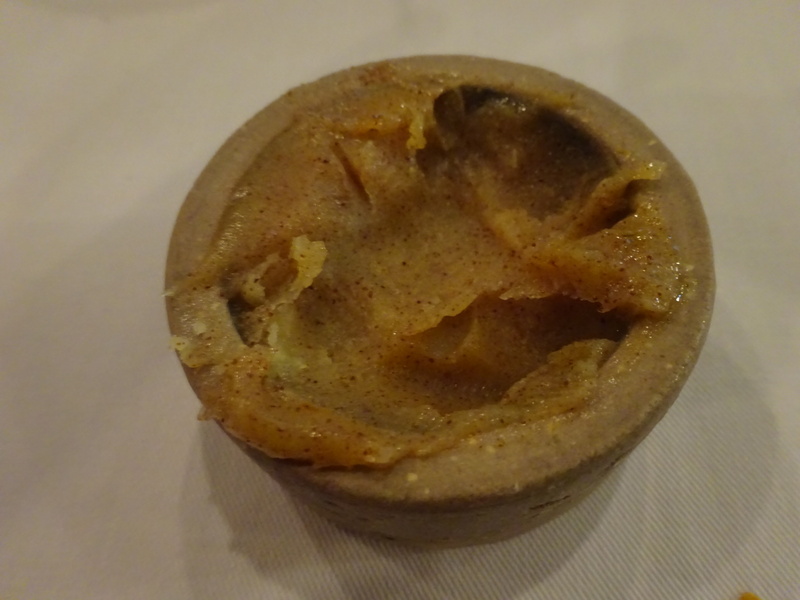 As many of you know, I am a sucker for a good bread course, and the bread at Central was no exception. 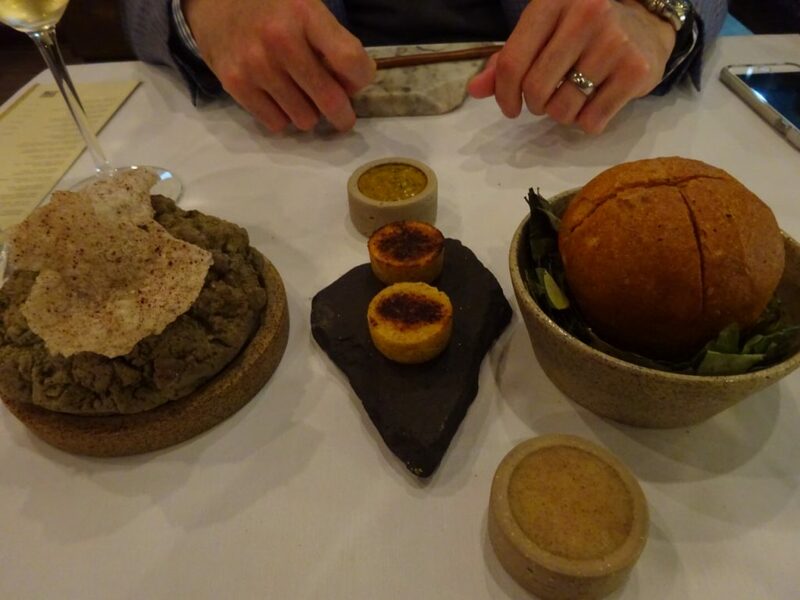 We were served three different “breads” – a traditional loaf, corn bread, and crackers (I think it was potato based?) Alongside these starches was a tasty salsa, as well as slow-roasted butter. This butter was AMAZING. Apparently chef Martinez roasts the butter in the oven for hours. It tasted like butter biscuits with cinnamon – or the ultimate toasty, nutty comfort food. I told our server multiple times that I wanted to purchase a tub of this butter. He said I was not the first patron to request this (alas, this is not an option). 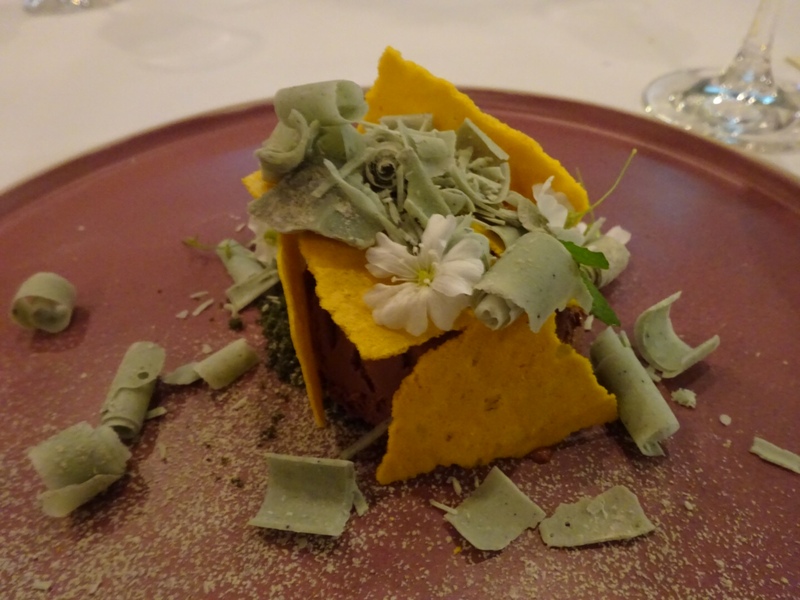 The standout dessert of the night was the “Green Highlands” which included the delicious butterscotch-flavored local fruit lúcuma, cacao, and edible clay. I have no idea why this clay is edible, but I didn’t care. It was mixed with white chocolate and melted in my mouth. We thoroughly enjoyed our meal at Central. The food was unique, creative, and delicious. The price point was very reasonable for what we got – you definitely get a lot of bang for your buck in South America. A few small annoyances we ran into were the fact that we had to wait in a long line when we arrived for dinner (this seemed like poor service for such a high end restaurant), and the wine pairing was a bit skimpy (we often had to share a glass of wine between several courses). But aside from that, we left happy and would definitely return. 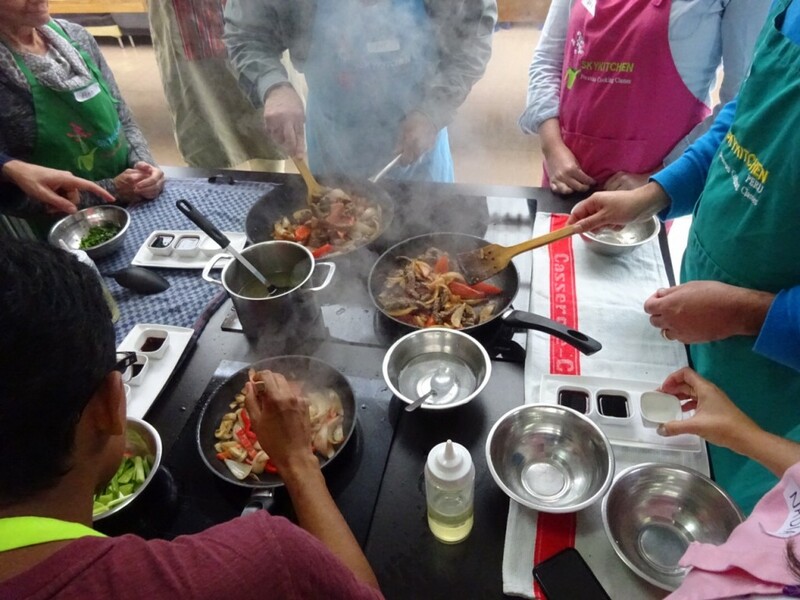 The next day we did one of my favorite activities while on vacation: we took a cooking class. 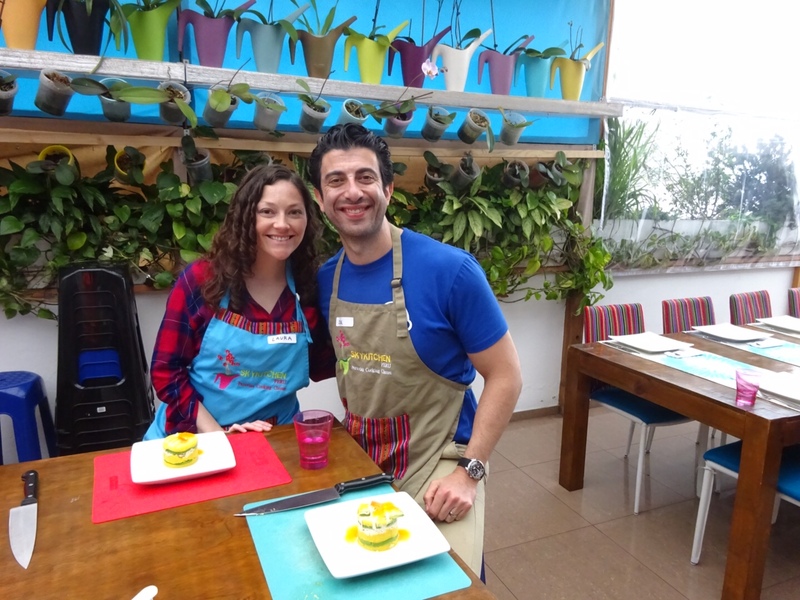 We knew that we wanted to take a cooking class at some point in our trip, and Lima turned out to be the perfect place, since we got to make use of the coastal location and learn to make ceviche. I found Sky Kitchen on TripAdvisor, which had stellar reviews. It is located on the rooftop of a high end apartment building in Miraflores. The space is really nice with great views of foggy Lima, and plenty of room to make and eat your meal, and to socialize with new friends. 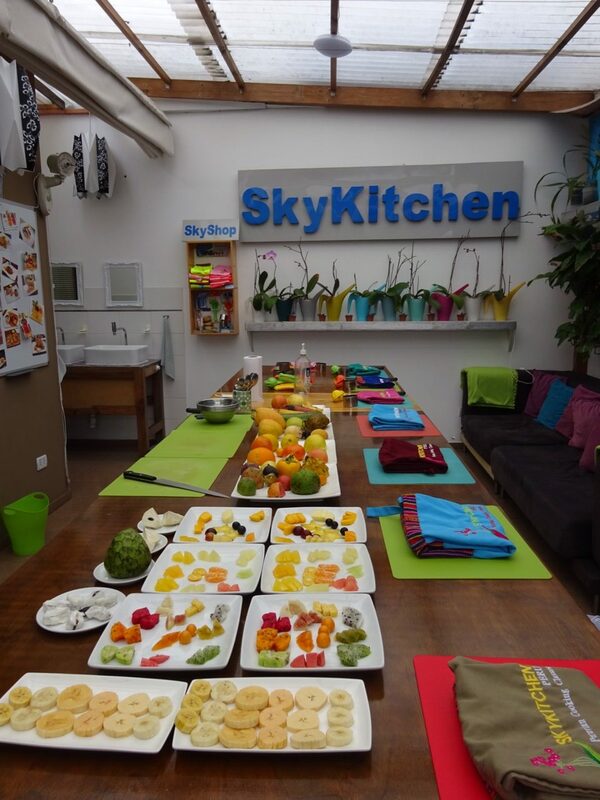 We opted for the hourlong local fruit tasting class, as well as the Peruvian Classics cooking course. They also have an optional market tour that we decided to skip this time around. The class was taught in English, though they offered interpreter service in Spanish for a Brazilian couple in our class. The Peruvian Classics course included four dishes: causas, ceviche, lomo saltado (Chinese-inspired steak and vegetables), and picarones (doughnut-like street food). Our instructor was a German man who had relocated to Lima to learn Spanish, and now teaches these courses. 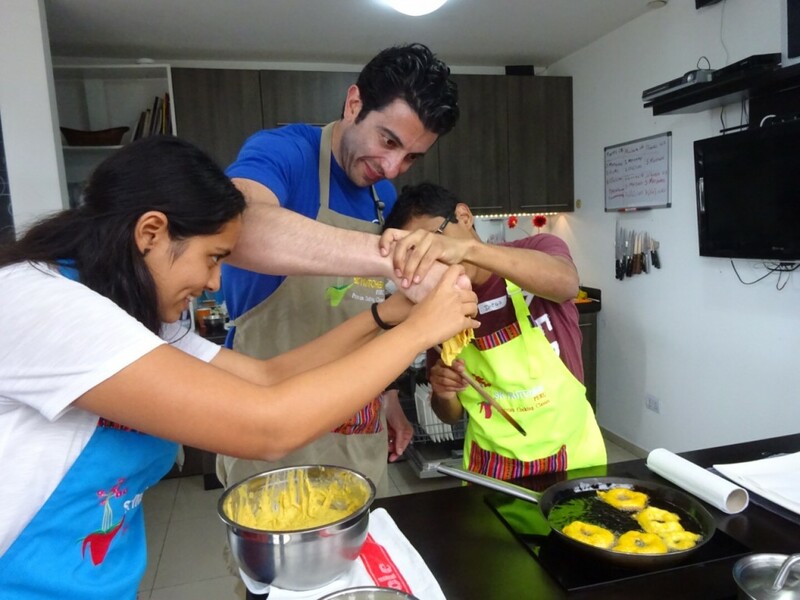 Not only did he teach us how to cook some delicious Peruvian dishes, but he also talked a lot about the rich history of Peru including how Chinese immigrants in the late 1800’s helped to shape the culture and cuisine of Lima specifically. Our class was made up of really interesting people: a group of healthcare professionals from Orange County, California who had just completed a medical mission in a rural area of Peru (whom we bumped into at Machu Picchu a week later! ), a young woman from Minnesota who is teaching English in Bogotá, Colombia, and a couple from São Paulo, Brazil expecting their first baby. Unfortunately the class did not provide any alcohol due to their license; if I were to take this class again, I would bring a bottle of pisco to share with the group! Our instructors helping Jack form the perfect picaron! 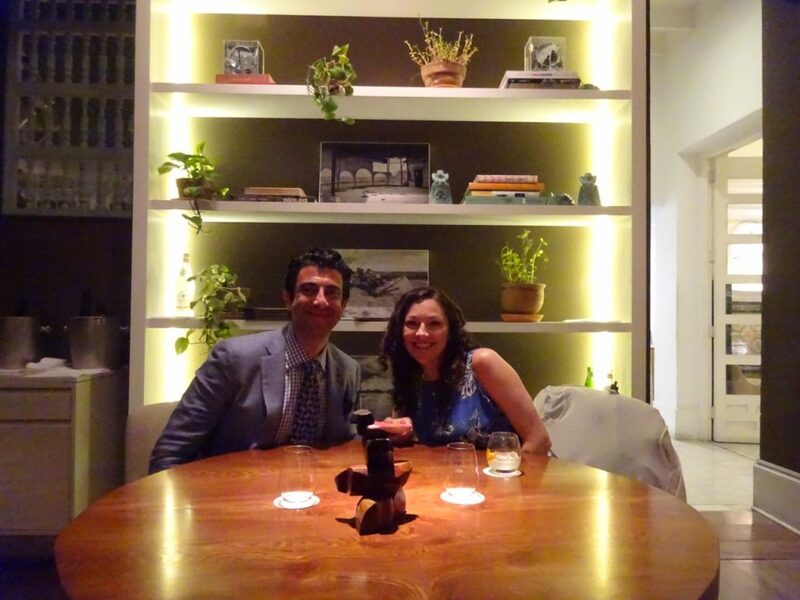 The other fancy meal we had in Lima was at Astrid y Gastón, which is Number 30 on the Best Restaurants of the World list. 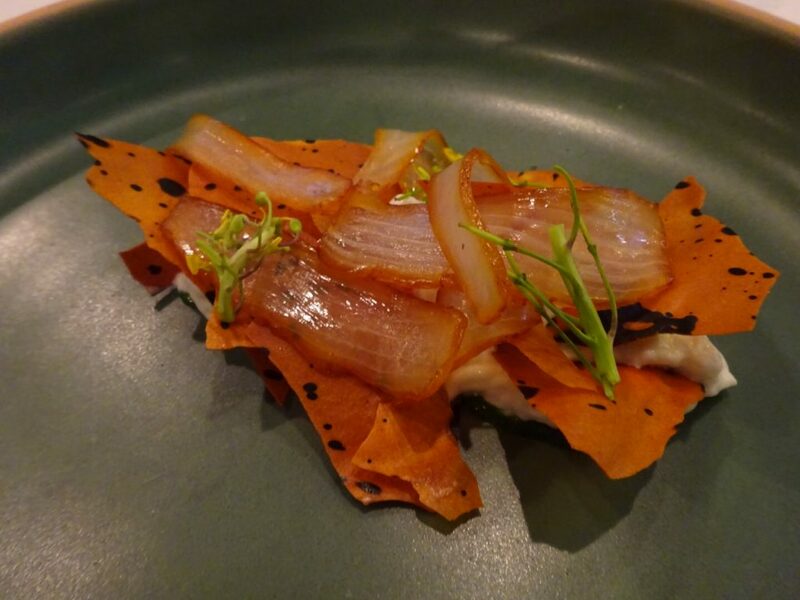 This is another restaurant by Gastón Acurio (of La Mar), which he opened in Miraflores in 1994 with his wife/fellow chef Astrid Gutsche; in 2014, they moved their restaurant to a beautiful hacienda in San Isidro. We didn’t really know what to expect at Astrid y Gastón after eating at Central, but boy were we impressed. 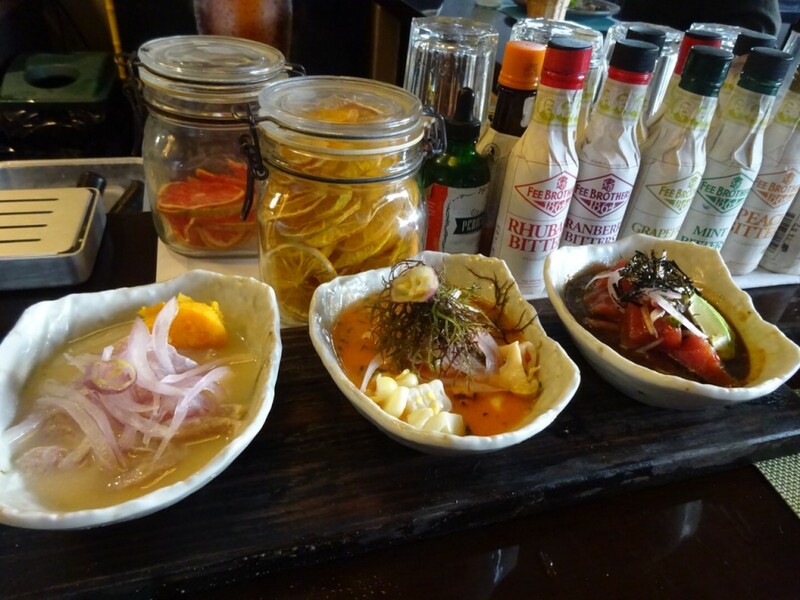 The restaurant focuses on highlighting traditional Peruvian dishes, rather that on the individual ingredients like Central. 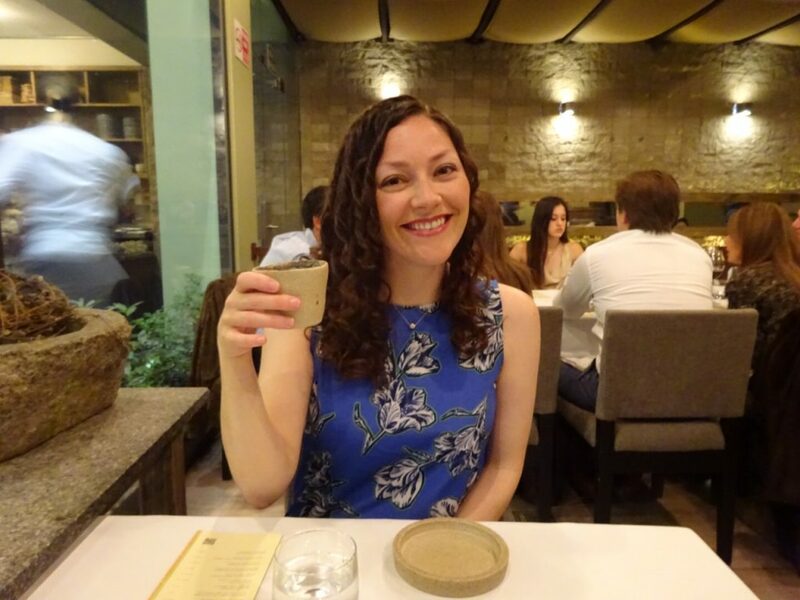 This was our final night together in Peru, and it was a fabulous way to end two weeks of Peruvian adventures and incredible meals. The food at Astrid y Gastón was outstanding. Jack and I both ultimately decided that the food was tastier than Central’s, though Central is taking more creative risks. 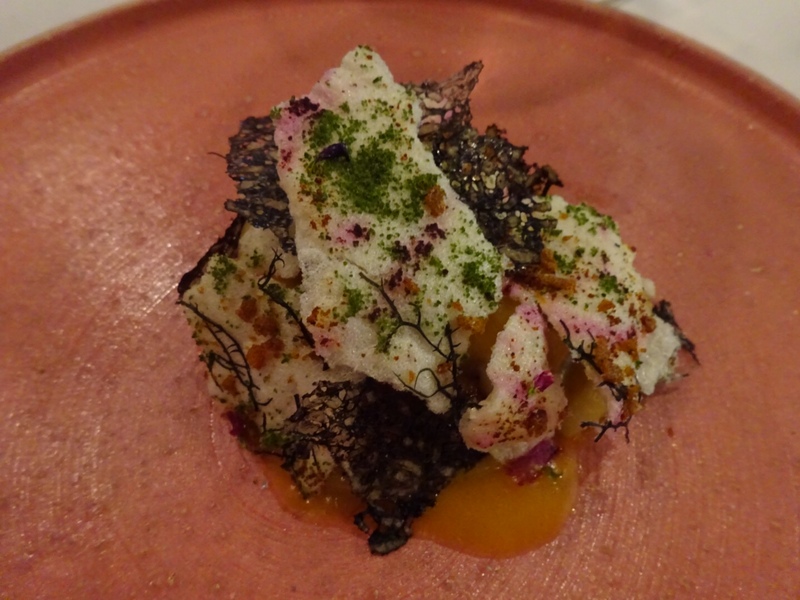 The dishes that really stood out to us at Astrid y Gastón were the two ceviches (fish and veggie), the uni pasta, the cuy (guinea pig) taco, the fried poached egg, and the lúcuma pastry. Delish! The cuisine in Lima was the real deal. We didn’t have a lot of time to explore different neighborhoods and sites, but we experienced the city through food. 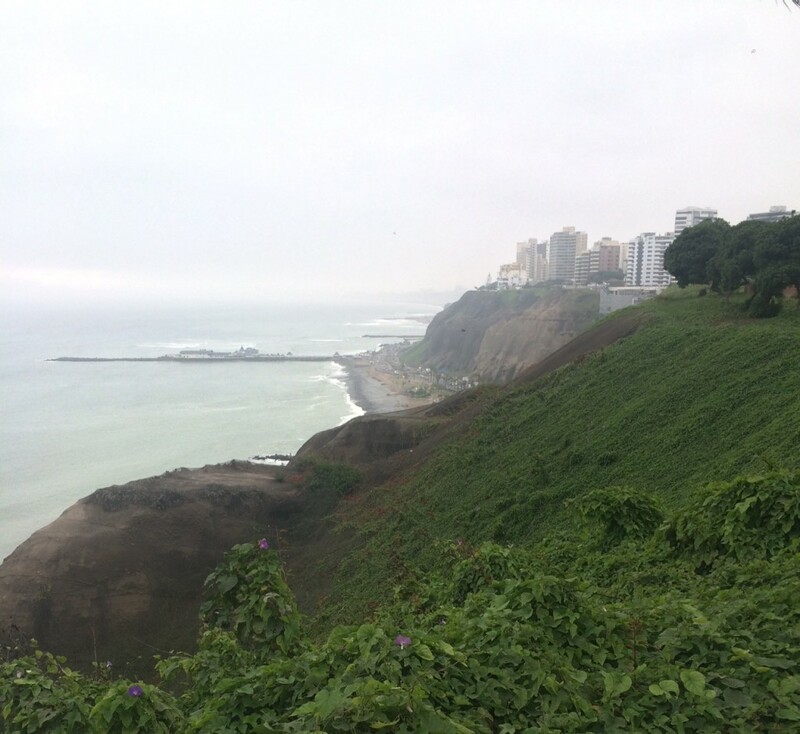 I would love to return to Lima some day in the summertime – I want to see the paragliders along the bluffs, go to the beach, and enjoy the sunshine. 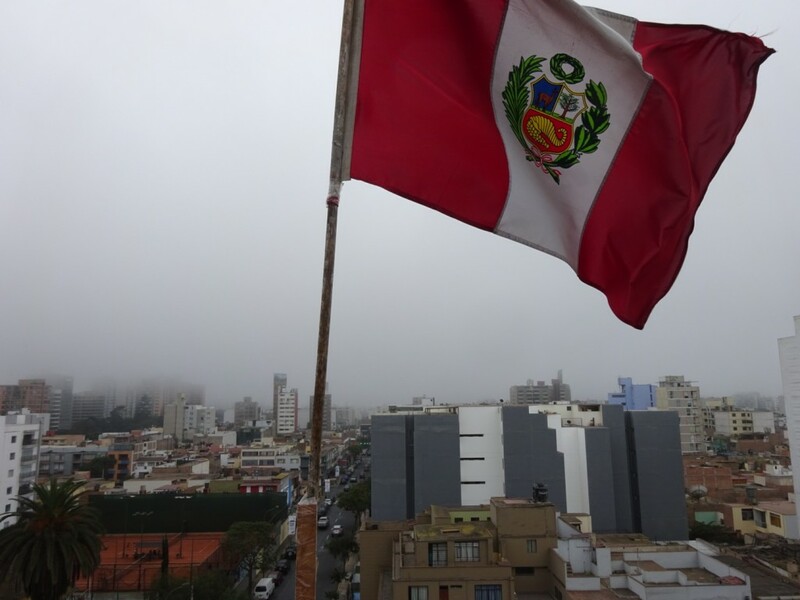 But even in the fog, Lima has an energy that is infectious. Until next time! Previous PostIn Situ at SFMOMANext PostBlogiversary! I am so glad you finally found time to put this together. Your writing is so specific, clear, and descriptive; I loved reading this. I think you are fortunate that both you and Jack enjoy travelling, obviously, so do Chuck and I. We have friends where one partner likes to travel and the other won’t fly. It’s such a big expenditure that it is hard to justify spending all that money alone. We are gearing up for New Zealand in February. Have you been there? I really trust your food recommendations. I couldn’t agree more about having a partner who loves to travel. Jack and I have a lot of differences, but we are very similar in our love of travel and food. We also like to travel the same way – not too busy or overcommitted, so we have time to wander… I have not been to New Zealand yet, but my parents went last year. I’m sure my mom could give you some great tips!